I am ridiculously excited for Fall. It’s been this way ever since I was a kid. Yes, there’s a ton of fun to be had in the summer. From vacation, to swimming pools to low carb ice creams… but for me there’s nothing like cooler weather, falling leaves, sweaters and boots. 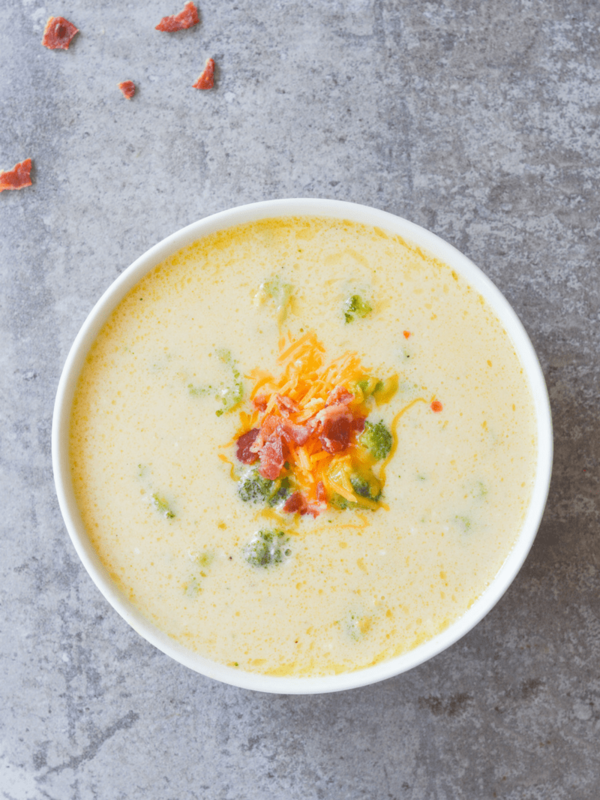 So this year, I’ve decided to really bulk up Hey Keto Mama with delicious Fall recipes of comfort food to keep your tummies full and warm all season long…Keto style! Today’s the start of that. So I’m bringing you a brand new, delicious recipe for one of my all time favorites.. 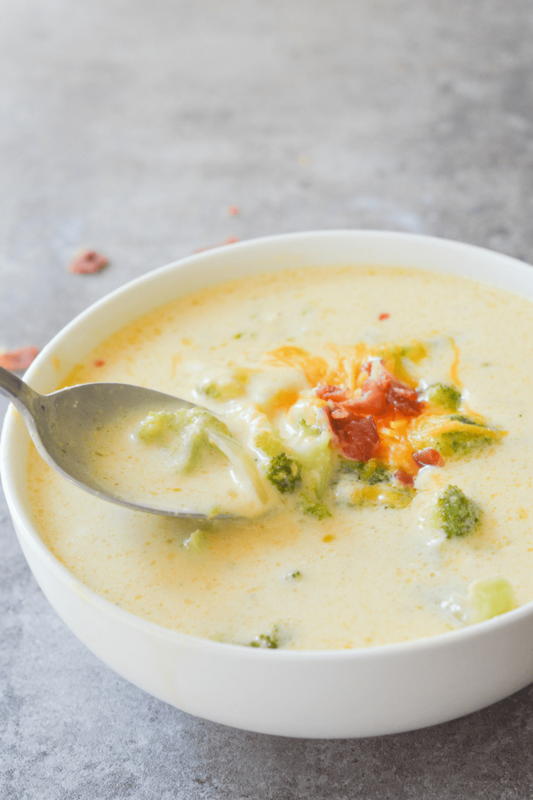 This soup is creamy, delicious, and very low carb. To be clear, it has a thinner, more broth-like consistency because it does not have a roux or any thickening agents. The taste is spot on, but if you don’t add something like xanthan gum, it won’t be the thick soup you might be used to. One of the things I’ve learned through being Keto is that expectations are everything. At first I missed the super full feeling all those carbs used to give me. Everything was just so dense. My tastes have changed and that’s a good thing. Keto recipes are filling in a different way. They give you fuel but without that over full feeling that causes lethargy. I also think it’s helpful knowing that although there are AMAZING keto recreations, they just aren’t the same tasting as high carb food. Using different, fresher ingredients brings out flavors you might have missed before and often the textures are a bit different- all in a good way. I never intended this to be a Panera Copy Cat recipe because theirs is very thick and just not quite what I was going for. That being said, I think this soup is super flavorful and really hits the spot. It’s just not a copycat recipe. If you do like a thicker soup, xanthan gum is a really easy thickener to find. I grabbed mine from the baking section at the grocery store. Just a little bit goes a long way! It will definitely make your soup thick, creamy and delicious without altering the taste. Don’t let the serving size fool you, this soup is very filling with 24g of fat per serving. Remember: Fat keeps you full! If you want a more hearty meal this would go great with a keto dinner roll and salad. Recently, I started putting Everything But the Bagel Seasoning on my rolls and they are even more incredible! Here’s the nutritional information (based on my amateur estimates via MyFitnessPal) for one 3/4 cup serving. I’d even encourage non-low carb people to give it a try if you’re curious about the ketogenic lifestyle. This may just help you make the switch! In large pot, saute onion and garlic with butter over medium heat until onions are softened and translucent. Add broth and broccoli to pot.Cook broccoli until tender. Add salt, pepper and desired seasoning. Place cream cheese in small bowl and heat in microwave for ~30 seconds until soft and easily stirred. Stir heavy whipping cream and cream cheese into soup; bring to a boil. Turn off heat and quickly stir in cheddar cheese. Stir in xanthan gum, if desired. Allow to thicken. This soup has a thinner, more broth-like consistency because it does not have a roux or any thickening agents. If you don’t add something like xanthan gum, it won’t be the thick soup you might be used to. THis looks beautiful. Do you know how well it freezes? I was hoping to make a double batch and freeze it in serving sizes…. So I guess I need to know the serving size as well 😀 Thanks for all your hard work!! I’ve made this soup a lot with loads more broc, cauli and garlic, I add feta and didn’t use cream. I blitz it and it freezes perfectly. Even the kids love it! My sis in law puts blue cheese in it which I really like too. Wow that sounds good! Can I have that recipe? My goodness! Simply delicious! I actually tripled the recipe and I’m so glad I did. Will make over and over again. Thanks for this awesome recipe! This is really good! Thank you for sharing your recipe. Next time, I’ll double it because we ate all of this in a few minutes! I am not a great cook but this was easy and I too will double the recipe because it was gone and more was wanted. 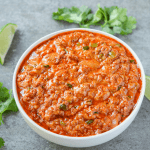 This recipe fits right in with my keto diet and it was delicious. Yes… I love it as well. But I don’t use xanthan gum. I replaced that with unflavored powdered beef gelatin and it worked out great! Love, love, love it! How much beef gelatin did you use? Did you bloom it first then added it in the soup or did you just add it straight to boiling soup to thicken? I haven’t yet, but I expect it would work out pretty well! Let me know if you try it! I had to double this yummy soup! Also added 1.4 tsp of both nutmeg and thyme…yummy perfection! I’m assuming the nutritional facts are for one serving and not the whole 4 servings that the recipe makes, correct? When I enter this into Carb Manager app, it has macros of: Carbs 16, Fat 43, Protein 19, Calories 52. And that is without adding the 2 slices of bacon in. Yikes. Delicious for sure but very not Keto friendly considering most people are trying to stay under 16 carbs in a whole day. Does this soup turn out thick and creamy? Mix up some flax seed meal (you can get that anywhere now – grocery store) in a cup of cold water mixing well and add slowly to soup stirring like it was flour and it works perfect for me. If you need more flax go ahead… it’s 0g carbs and all fiber. I will just sprinkle some on top of other foods just for the health benefits of it. It’s an easy Google. Good luck!! I added the xanthan gum and it thickened as it cooled. was awesome. I also added 1/2 Tsp. dry mustard to the onion/butter when they were cooked. Could you make a roux with almond or coconut flour? Haven’t tried it but let me know if you do! Those will add extra carbs of course, you could try adding a little xanthan gum if you would like something thicker. What would you use if you didn’t have Xanthum Gum? You can also use Guar Guar to thicken recipes. I bought both xanthan gum and guar guar from Amazon. I use them both in lots of recipes including making keto pecan pies and keto pancake syrup, so you will use it often. Don’t try to use coconut flour because it absorbs all the liquid you put it in and almond flour will not thicken anything. blend up some of the broc to thicken the soup. You can now buy minced broccoli. It works great as a thickener plus added flavor. I’ve tried making a roux with coconut flour and it didn’t work well, it left my soup looking like the milk had curdled. Tasted fine but it didn’t work like a traditional roux with wheat flour. It turned out very yummy, but the cheese for me just melted and stayed at the bottom, not mixing in at all! It could be the brand of cheese you used or you could’ve needed to keep stirring and increase the heat a little to make sure it was fully incorporated. Glad you liked the flavor! If you have a stick blender, I find that helps with incorporating tough to melt cheese. Remove some broccoli first if you still want chunks. Did you use a bag of pre-shredded cheese? They use tree pulp as an additive to prevent the cheese from sticking to itself, it can add a grainy texture to a recipe like this. If you wanted a thicker consistency, I’d cut the broth by a half cup (or a full cup) and puree the soup with an emersion blender before adding the cream mixture and cheese. Yes it will change the consistency but you could always add some additional chopped broccoli if you’re looking for something chunky. I’d puree it super smooth and then garnish with charred broccoli, bacon crumbles and more cheese and or some sour cream. This was absolutely delicious! I substituted mushrooms for brocolli because I am not a broccoli fan (I know, i know, it’s broccoli cheese soup) and just added a little paprika and nutmeg for flavor. I also added 1/2 tsp xanthan gum and it made it VERY thick and more like a traditional cheese soup. I would strongly recommend doubling the recipe as it really only makes about two portions. I made this and it was delicious! I added asparagus to mine and just doubled the recipe. Great soup, had 2 bowls for dinner , hoping my son and friend won’t want a bowl so I can keep it all for me for my dinner tomorrow, I’m bad I know lol. Delicious recipe! I added some cauliflower & a little extra cheddar. Wonderful! Thank you. I am a canner. especially soups and chilis. Would this be good for canning? I’m not familiar with canning soups. However, I googled it and the resources said canning isn’t recommended for items with dairy, So I don’t think this soup would be a good choice,unfortunately. If you omit the dairy you can use a canning system and then prepare it later with the dairy. No canning for this soup, only freezing! This was really good. I added a thickener (1tsp) and a black and red pepper mix to add some heat. Very easy to make and hard to not eat the entire batch! Flavor outstanding! I too added nutmeg and thyme and it was delicious ❤️. I couldn’t find my guar gum so i drank it from the mug. Very tasty! Thank you so much for doing all the testing to develop this soup. It will be the base for many more soups! Made it today, love it! OMG! My whole household loved this soup! It was AMAZING! We like our soups pretty thick so I tripled the recipe, and just left out 2 cops of broth and it was perfect! ???????????? Thank you! Delicious, thank you! I used jalepeno cream cheese and it gave it a little bite. I would have given this 10 stars if possible. This soup is absolutely amazing especially given the simplicity of the ingredients. I did research this weekend in order to prepare for a full week of low carb meals that not only I could eat but that my four boys would eat as well. This one was at the top of my list and I am not disappointed. My 20 year old just tried this and he said he will never eat soup out of a can again. I made one addition and added sautéed diced celery which adds additional texture to the soup without the addition of carbs but otherwise followed the recipe to the letter. I also sprinkled a little hot Hungarian paprika before serving which adds a little color and a small amount of heat. 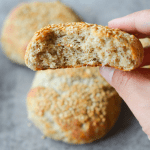 Thank you very much for sharing this recipe, it is definitely a great addition to a low carb lifestyle. I made a double batch after reading the recipe. So delicious. I am struggling with getting enough fats, so just poured bacon fat in the soup as well. Also, used an immersion blender just to smooth it out. I did this soup tonight and thought it was tasty. I did add the xanthan gum because I prefer it to be thicker. It turned out better than I anticipated. I have an issue. I made it once and it was perfect without cream cheese. The next time all I had was cheddar jack and did not use cream cheese. After following the directions perfectly, the cheese completely didnt melt and coagulated in the bottom of the pan! HELP! Hi! I rarely comment on recipes but this one deserves it! This is simply delicious! Ive made it 4 times in 2 weeks lol. 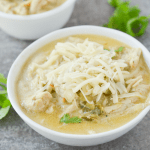 I’m on week 4 of Keto diet and this soup has helped with my comfort cravings for sure! The xanthan gum definitely works but for those who haven’t used it….when you add the 1/2 teaspoon, wait awhile it WILL thicken. I didn’t wait and thought soup too thin for me so added more….ended up with broccoli cheese pudding ???????? but was still delicious! I add 1/3 tsp of celery salt and it helps cut richness a bit. Thanks for great recipe! Hey — broccoli cheese pudding, I LIKE the sound of that, every bit as much as the soup option. Thanks for the idea! Just what I needed to keep me motivated early in my low carb diet! So delicious. I added a little extra cheese and cream but didn’t use a thickening agent and the thin broth didn’t bother me. I would make this every day! Hi! Does the nutrition information include the optional bacon? I made this today and it is wonderful! Better than expected. Very easy to make. I doubled the recipe and it was perfect. Thank you so much for the recipe. Try a creamy soup with an immersion blender. Comes out quite good, and I added mozzarella cheese as well. This was incredible!!! Enjoyed it all the way to the bottom of my bowl… in which I scraped!!! So glad I found this recipe and I can’t wait to try more of them. This is amazing. I have used all the suggestions. Doubling it is a must as is adding more broçcoli or cauliflower. I have even added some shredded chicken and chyanne pepper for a change. Four servings??? Uhhh…I ate the whole thing in one sitting! It was delicious. I used Tapioca Flour for thickening since I didn’t have xanthan gum, worked okay, probably didn’t wait long enough since I was starving. I’d make this again in a heartbeat, very easy and good! Crazy good and very filling. This will be a go to for Keto and the whole family. Everything you want from a broccoli soup. Such a delisb and easy to follow recipe. Tbanks!! So yummy and amazing! I used the xanthum gum so it was nice and thick but not too thick. Thanks for sharing this recipe! I will definitely make it again! Just started this keto journey. The soup was delicious and hubby approved!! I doubled it and both my husband and I took it to lunch the following day. Thanks for sharing. Making it again, for sure. So happy you both enjoyed it! Delicious soup. Very easy to make. I followed your exact instructions. Turned our beautifully.Thanks for the recipe. Made this tonight for my family. Tripled the recipe and started with sautéed onion in butter. Towards the end I added a little bit of Sherry which added a wonderful flavor!! Really enjoyed!! Made this for dinner tonight and it was great! Only thing I changed was to remove and blend some of the broccoli and broth before adding the cream and cheese to give it a thicker consistency. I didn’t have xanthan gum. I also added a little Monterey Jack along with the cheddar because I had it, so why not? It’s a hot summer day and I’m not feeling up to par. 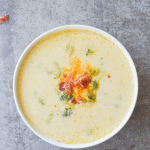 I wanted an easy creamy soup for dinner and this was it! The soup is super easy to make and absolutely delicious! I made my hubby try it(he thinks I’m crazy eating soup in this heat) but even he debated grabbing a small bowl after he tasted it! Easy, quick and delicious, my favorite kind of recipe! Wow. This is simple yet amazing. I took the broccoli out before adding cheese and blended it to thicken. Delicious! My husband and son loved it too. We used to get Panera’s broccoli cheddar before. Thank you! This was absolutely fantastic. I followed recipe exact. This was amazing!! I doubled the recipe, and only used 1 1/2 cup of chicken broth and added an additional 1/2 cup of broccoli. I also splashed in a bit more heavy cream, and used sharp cheddar. Super thick without having to use a thickener. This is delicious!!! I will definitely be making this again and again!!! Thanks for sharing. ???? I made this for the first time today and it turned out really good. I like to have some on hand so I quadrupled the recipe. I will also freeze some as well. I found the taste and texture to be very good. My only issue I had was that the cheddar cheese was a bit separated from the soup. It seems to stick to my spoons and ladel when stirring and mixing. Other than that it’s a keeper. Something I should have looked into before I started would have been making a roux with xanthan gum. I think the cheddar cheese would have melted and blended in better. I am new to keto and always looking for delishish meals that we used to like eating. This soup is delicious! I quadrupled the recipe, and I added 3 garlic cloves, and made it in 15 minutes in my Instant pot. I sauteed the onions and garlic in the butter first than added the stems and half the broccoli florets to saute for a minute. I saved the rest of the florets to add later. Then added my homemade chicken broth (saved from when i make chicken in my IP) and cooked for 5 min HP. I did QR, used my immersion blender to whiz all the soup together (not too fine) and then added the remainig florets and set the IP to saute. When the florets were crisp tender, i turned off thd IP and added the cream and then stirred in the cheese a little at a time until incorporated. Really good soup! Thanks a million! This is the best recipe I’ve seen with the lowest carbs. Much creamier consistency than other recipes I’ve tried. Sane cheesy taste but because there’s less cheese it doesn’t get all gummed up like other recipes. Thanks for posting!! I made a double batch. Absolutely filling and delicious! This is simple to made yet amazing. Love it! Will make it again and again now with winter coming. Made as directed. Thank you for the recipe!! The soup was amazing!! All I did different is that I used my stick blender and blended it – that automatically makes the soup thicker. Did not have to add and Xanthan gum. Talk about delicious!!!,. I had to add extra broth and it still was only 3 servings!,. It thickened very nicely and it was one of the best soups I’ve had. I had added a tiny bit of extra broccoli so I’m wondering if that made a difference,. Or if it was I let the broth and broccoli cook a bit linger to mk sure broccoli was soft. Either way was very good. So this soup has become a staples for my house over the last few weeks! Everyone’s including my 7 year old love it. He opted to bring this for school lunch last week so I just sent it in a thermos for him! I’m current making a quad batch lol we just can’t get enough! Delicious soup. I used cauliflower to thicken. Boiled broth with onion, cauliflower and garlic then puréed. Followed recipe from there. SO good and easy to follow! Skipped the heavy cream and it was still thick and creamy with the xantham gum. Mmmm! Even my picky 8-year old loved it, thank you! This soup was so good! Thank you for sharing it with us!! Loved this soup. If you have a powerful blender, blend 1-2 TBS cashews with half the broth. Add it in after the broccoli has cooked a little. It will thicken your soup and make it creamy. Make sure you blend it well so that you don’t have cashew chunks in your soup. I did this (added to the blender before adding cream cheese, whipping cream, cheddar & xanthum gum) and I held back a few cooked broccoli crowns, chopped them up even more and added them back. The result was a thick soup that just the right amount of stuff to chew on, It was awesome! Omg! So good I almost licked the bowl! Tripled the recipe for my family of 8. I cut out 2 cups of broth and added an extra cup of heavy cream to make it creamier. Also blended with my smart stick blender. I didn’t have chicken broth so I used water and added chicken bullion (to taste). So easy! I will keep this delicious recipe forever! Thank you!! This soup was very good made just as listed. I did not miss the thickness at all. Yes, it is a thinner soup, but it is wondrously rich and tasty. When softening the cream cheese be careful to not over-microwave it. Do 10 or 15 seconds first, then a little more if needed. I used a plastic whisk to blend everything together at the end. I was looking for a soup I could make for a church event which would give a keto/Atkins friendly option to those of us living the low-carb lifestyle. This definitely is it! This is one of the best and easiest recipes I’ve ever made!!! Delicious! I used chicken bone broth, a teaspoon of Better than Bouillon a little extra garlic powder! I also used frozen broccoli florets, microwaved them about half done and then added them to the broth. I also added a little cooked chicken. Delish! Made it exactly per recipe. I’m adding this to our menu for sure! Made this tonight! Wasn’t feeling the best and soup on this chilly night is what I needed. Super yummy! Added salt, pepper, and chili powder. Next time I will double the batch so I have more leftovers! DELISH i just followed your recipe minus the thickener stuff i added more broccoli and i threw in some chopped fine spinach WOW so good my mom had 2 big bowls she isnt on keto lol,, VERY good soup Thanks for sharing.. Delicious! Thank you Sam! I would definitely double this recipe. Next time I think I will quadruple it. For those of you who are on the fence about buying and using xanthum gum, I think it is totally worth it especially if you like to cook and are doing low carb. The first time I made this I used ground chia seeds as a thickener. It kinda worked and I liked it, but was a bit weird and don’t think it would have been a crowd pleaser. The xanthum gum makes this almost indistinguishable from a restaurant broccoli cheese soup. I added some mustard powder, garlic powder, smoked paprika, turmeric and lots of pepper. Got carried away with the immersion blender and regretted not having some chunks in the soup. Will remember for next time. Might sauté some celery as someone mentioned and throw them in for texture. Loved it! Took broccoli out when cooked for about 30 seconds in my silver bullet blender. Added it back in to make soup a little thicker. I will make this again (and again & again). Thank you for a great recipe! What about using an arrowroot+water slurry to thicken the soup? I haven’t done it myself, but I’ve seen it done with good results! Just finished making it and its absolutely delicious. So savory. I made double the batch from the get-go, because I knew I would love it just from the ingredients list alone. Definitely more of a creamy broth when you add the xantham gum. I made a vegetarian version for my husband and used a vegetable broth instead…..just as tasty. Thanks for sharing. I loved it so much that I ate the whole pot! Did not need thickening, but i did put it it’ll the Vitamix to smooth it out. Great recipe ! Thanks for sharing! I was so pleasantly surprised at how flavorful this was being new to keto. While cooking I had a somewhat of a negative attitude because I knew it was not going to get thick & creamy but I was licking my fingers! I did not have xanthan gum. The only change I made was adding cauliflower rice. I will continue to make this for the whole non keto family. Loved it! This keto soup is the best I’ve had! Other 2 in the family love it also. I can’t keep any leftovers for myself, they eat it right up. Thanks for posting a great recipe!! So good!! I added xanthan gum, some apple cider vin and 1/4 cup of shredded Parmesan cheese also to give it a little tang and it was amazing! This soup is awesome! I always double it because we like left overs. I tried it last night and added mushrooms that I sauteed in butter and rotisserie chicken that I had pulled off the bone and shredded! According to my husband, this was the best soup ever! We loved it! Don’t be scared to add different things. Thanks for posting this recipe! Made this last night and it turned out perfect. Did not make any modifications. Will definitely make again. I haven’t made this recipe as today, but I will definitely after the holidays and then rate it then..I was wondering if you don’t have xanthan gum, couldn’t you use cornstarch with a little bit of chicken stock to thicken the soup? I didn’t know if it works with being on the Ketosis diet. I can’t wait to make this for my husband. This soup is amazing!!! Thank you!!! Discovered this recipe because after having a tooth ache, soup is all I could tolerate. One problem is that I have never made a soup from scratch and I am not the best cook. Still tried it. Really easy to follow recipe which I followed precisely except for the xanthum gum. I thought it was the perfect texture. After reading the comments I shredded the cheddar cheese myself instead of buying it already shredded, and it melted immediately into the soup. Thank you so much for the recipe, it is delicious and filling. Will make again without doubt. So good and easy to make! I’m a week into keto and this is the first soup I’ve made. I really like this because I’ve been struggling to get enough fat, but after 1.5 servings, I’m full and feeling good. Keto is hard at the beginning, but recipes like this make me feel like I can actually do it. Can this recepi be put in a crockpot at low temperature. I wouldn’t recommend it because I think you’d have to add most of the ingredients in later. I don’t imagine the cream cheese, cream or cheddar doing well in the pot for an extended period. Made double, husband loves it..Bacon adds nice flavor. This was delicious!! I usually follow recipes based on what I have at home so I used evaporated milk instead of whipping cream, Better than Bouillon and a little homemade bone broth for the broth and nutritional yeast in place of xantham gum. It really was amazing!! Will definitely make again based on the original recipe. May still add some nutritional yeast because it blend so nice with the cheesy flavors and thickens as well. my husband, kids, and I all loved! I didn’t use the xantham gum but instead added a little more cheese and a little more broc and it was a great consistency! will def. make again!! and share with others! Made this tonight but used fresh asparagus and only used a frying pan instead of a pot and it came out thick and creamy without guar ot xanthan gum! Delish! Added a tbsp nore of cream cheese as well… tasted like soup from Panera’s! Thanks for the wonderful recipe! I am making this AGAIN tonight! The only things I changed was I doubled the recipe and added a little more cream cheese! I also didn’t use xanthan gum. I honestly cant get enough of it! Husband approved as well! Great recipe! I added a title paprika for color and some diced ham. Also thickened with a TBS of cornstarch. WOW, this soup is so good! I did use a potato masher to break up the broccoli and used one teaspoon of chia seeds as a thickener. Will be making this over and over again. Excellent taste! However, only made 2 servings. I got two servings of 3/4 cup. Need to triple or quadruple the recipe. 🙂 but tasted WONDERFUL! Omg! Its sooo good! I did it the first time and did not have xanthan gum available and it was a little liquid for my taste, I made it again today and it was amazing!!!!!! I added red pepper for a spicier taste! I love it! Thank you!!!!! Just made this and it was quick and delicious! I didn’t have xanthan gum so I mixed about a teaspoon of flax meal with some warm water, let that sit for a few minutes and added that in to help thicken the soup and it worked great. For spicing I added some salt and pepper, a bit of nutmeg, and a hint of cayenne pepper for a bit of a kick and it was great! I used my immersion blender (before adding the cheese) to break up the broccoli into smaller pieces while still leaving a few bigger pieces and it was just what I was looking for. Great recipe! thanks for posting!